When Theodore Roosevelt became President in 1901, he brought his wife and six kids – the largest group of youngsters in the White House. Theodore Roosevelt had the largest family living in the White House. (l. to r.: Ethel, TR, Ted, Archie, Alice, Kermit, Edith and Quentin. 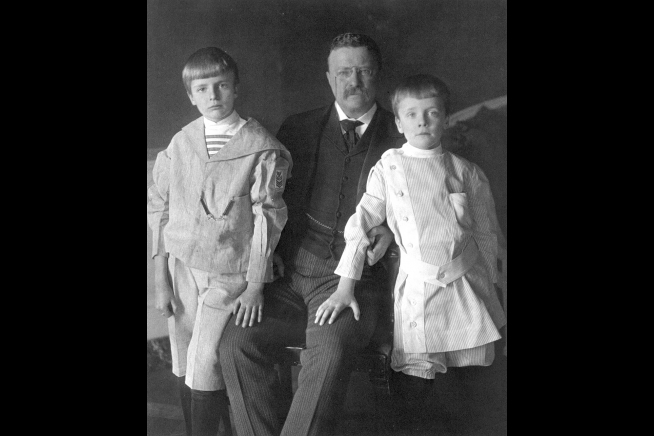 At 42, Theodore Roosevelt was our youngest president, and not surprisingly, his family was filled with youngsters. Alice, at seventeen, would become an immediate hit: pretty, and totally outrageous. Ted, at fourteen and Kermit, at twelve, were away at prep school most of the time. Ethel, at ten, was in a local school in Washington. Archie Roosevelt and Algonquin, one of the Roosevelts’ numerous pets. Quentin was three when he began living in the White House. He was an immediate hit. The activities of the White House Gang ran the gamut of sublime to ridiculous – and always noisy. They plotted obstacle courses in the corridors, played hide-and-seek wherever they wanted, created a baseball diamond on the grounds (without permission!) and even threw spitballs at some of the presidential portraits. They “borrowed” trays from the kitchen, and sledded down the backstairs. Nothing was sacred. 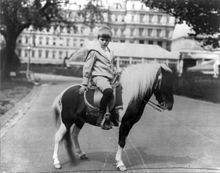 When Quentin was sick measles, Archie smuggled Algonquin, his pony, upstairs in the White House elevator to cheer up his ailing brother. The gang teased White House staff, visitors and diplomats, and was even said to throw snowballs from the White House roof – until forbidden by the Supreme Commander. Time, visitors, and even the august stature of their father’s position was meaningless to the pint-sized purveyors of mayhem. In fact, TR was almost as enthusiastic a participant as the rest of the gang. 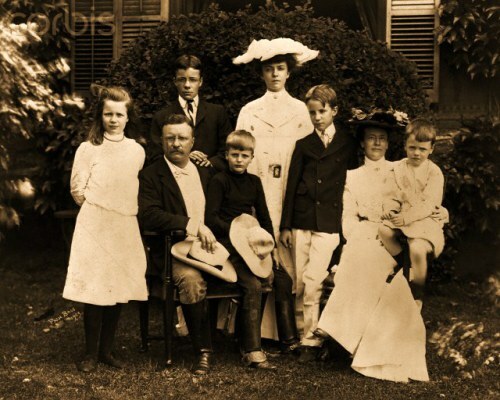 No President enjoyed romping with his family more than Theodore Roosevelt. Pictured here with Archie and Quentin. Theodore Roosevelt was President for seven and a half years, and kids, as kids do, got older, went to school and began to mature, at least somewhat. The “Gang” however, continued, albeit sporadically once schooling got underway, and time was needed for study. Some gangsters moved away, others were added, like Charlie Taft, when his father, William Howard Taft became TR’s Secretary of War. Charlie and Quentin were the same age, and became boon companions. One “gangster” who remained throughout was Earle Looker, a Washingtonian who became a well-known journalist and wrote a book called The White House Gang, recalling his youthful glimpse into an extraordinary opportunity. His memories added to the overall perspective of all the Roosevelts from the eyes of a child – eyes that seldom deceive. What is particularly refreshing is his observations about the closeness of parent-to-child, and in this case, parents-to-children. Theodore and Edith were always active and engaged parents. The family always came first. The “gangsters” stayed in touch, some more closely than others, as they grew up to follow their individual paths. Quentin Roosevelt, who most resembled his father in looks, build, exuberance, leadership qualities, varied interests and general intellect, had a talent all his own: mechanics. Growing up in the Age of the Airplane, he wanted to be an aerospace engineer. World War I interfered. Quentin Roosevelt enlisted in the French Air Force even before the US entered World War I. All four Roosevelt sons, including Quentin, volunteered well before the U.S. became involved. Kermit joined the British Army in the Middle East. Ted and Archie were severely wounded, and their recoveries would take months before they were up and around. “Q”, as his gang called him, joined a French squadron, looping-the-loop in little more than a box kite with a motor. He was shot down and killed. He was only twenty. All four of TR’s sons served in World War I. Ted and Archie were severely wounded. Quentin was killed in action. Quentin’s death devastated the family, particularly the former President and the Gang’s Supreme Commander. TR died at sixty, only a few months after learning that his youngest son had been killed. There was a natural outpouring of sympathy when the news of Quentin’s death was made public, to include the now-adult members of the White House Gang. Edith Roosevelt cherished the letters she received from some of the young men who had been little guys, racing through the White House hallways, waylaying the most important people in the country. According to Earle Looker, some of the Gang stayed in touch with their den mother for the rest of her long life. She lived to be eighty-seven. This entry was posted in A POTUS-FLOTUS Blog, Nifty History People, Theodore Roosevelt and tagged Alice Roosevelt, American history, Archie Roosevelt, Earle Looker, Ethel Roosevelt, Feather Schwartz Foster, First Lady Edith Roosevelt, history, Kermit Roosevelt, President Theodore Roosevelt, Presidential history, QuentinRoosevelt, Ted Roosevelt, The White House Gang, Theodore Roosevelt, Theodore Roosevelt Jr, Theodore Roosevelt's children, Theodore Roosevelt's family, TR, US history, White House history. Bookmark the permalink. “pint-sized purveyors of mayhem” – Love it!